First day back to work and I had lunch plans with Hagan from Wandering Foodie. 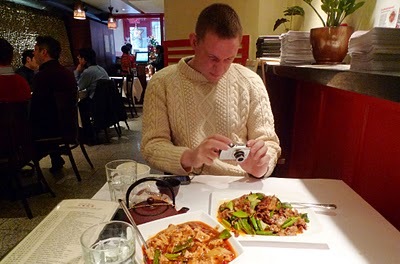 The 93 Plates Adventure is his project for the month of January, 3 meals a day at an array of restaurants throughout the city (93 joints in total), shared with a different NYC food blogger each time. He’s disregarding his waistline and pursuing the adventure he envisioned *applause*, specially when most people’s new year resolution goes exactly the opposite direction. When I arrived, they’ve already brought our table some appetizers. 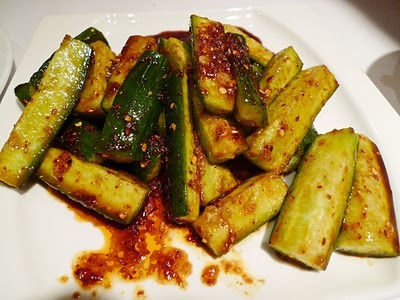 The Spicy Cucumber Salad is refreshing, garlicky and spicy. 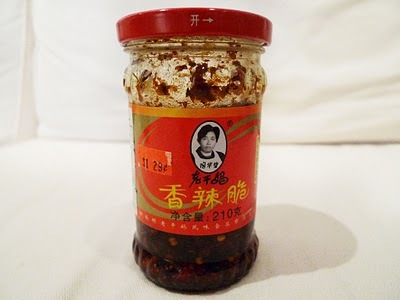 The flavors were really familiar and I kept thinking… I know this… finally I figure it out… The hot pepper sauce used is none other than this one: Lau Kan Ma (brand name) can be found in most chinese super markets. Mix, everything to taste and let it sit in fridge for a couple hrs. Best when done overnight. The pork dumpling in hot chili oil was bad. The pork filling tasted a little sour, plus I prefer my dumplings non frozen with hand made wraps, thank you very much! So we dismissed this one real quick, yuk! 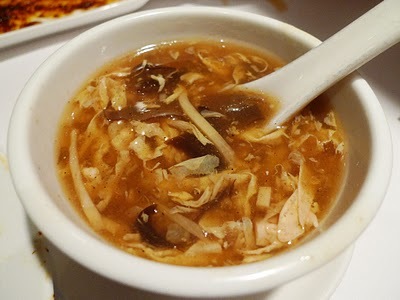 Hot and Sour Soup was good, actually a lot better than your average Chinese take out. 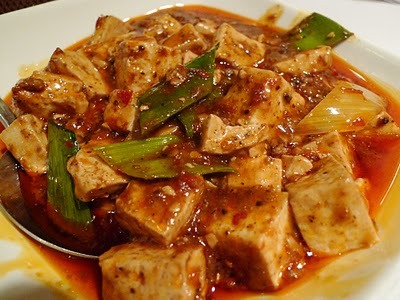 Ma Po Tofu is a staple in Szechuan cooking. I wasn’t convinced about this one. The spices actually tasted similar to the one from the cucumber (from the bottle) and didn’t compare to the distinct flavors I’ve come to love about this dish. 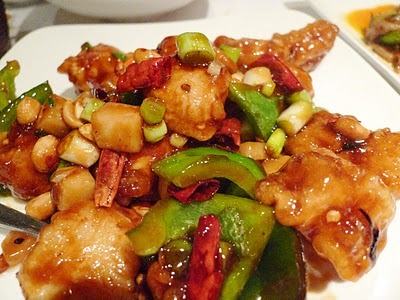 A good one uses a mix of Szechuan spices and has burn your tongue heat, and this had neither. I love Kong Pao anything, crunchy peanuts, spicy chilli pepper and cooked in a high heat wok, the combo just works with any meat (frog is my favorite). They had a Kong Pao Scallop, which I was totally looking forward to. The flavors were ok and I loved the crunchy bits of water chestnut, but wished the scallops weren’t breaded, it hid the natural sweetness and gave it a sesame chicken texture/thick coating. It was also sweeter than I would of liked. 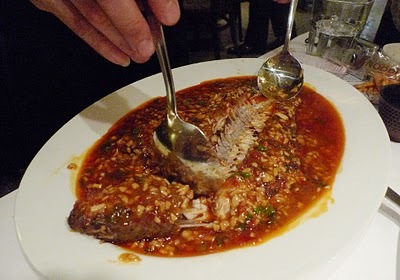 The owners wanted the 2 of us to try their specialties, so while our table was full, the waiters surprised us with a Whole Bass Braised with Spicy Hot Chili. Can you say garlic? Hagan predicted about 10 cloves. It’s not as hot as it looks, trust me, I can’t take my heat and I didn’t feel a thing. It’s a little sweet & sour. If we weren’t so full already, we would of ate it all. 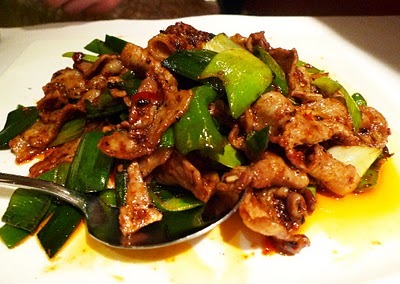 Hand down our favorite dish Stir Fried Pork Belly with Chili Leeks. I mean it’s pork belly, the star of any dish, any cuisine in my opinion. Who doesn’t love pork belly? that’s crazy talk! Tender slices, with peppers, leeks, garlic, chili and a little bit of black bean, this was love at first sight for us. Super fragrant, it holds all the good components of a stir fried dish. Oh so good with fluffy white rice. I would come back just for this! This dish alone would deserve plus. Overall it’s better than your average midtown chinese take-out. I was a little surprised, in a good way. Not everything pleased my palate, but as I read their menu, I was quite impressed with the options (usually not found in this part of town, like duck tongue!). Hey Cindy! Just finished dinner at Telepan with Hagan (so full!) and he was telling me how your lunch table was over-flowing with dishes! That pork belly definitely looks like a reason to visit. Btw, Happy New Year! Let's get together soon! What a lovely review and gorgeous photos! Ill have to check out his adventures in eating.. that will cost a fortune. tell me about it! i like it with noodle, and stir fry, actually it goes with anything! yeah, it's ambitious of him, sorta a more gourmet version of super size me! thanks!… yeah it will be an adventure, i think on the last day. all the bloggers will sit down for one last final hooray! … actually the BEST part is … this was all complimentary, he had arranged with all the restaurants to eat for free i believe… cheers to that! I'm surprised you even gave this restaurant 2 chubs and impressed you can spot frozen dumplings from afar. That is some good-looking food on these plates. Thank you! After such meal I'd probably check more plates and to maximize the pleasure I'd try name plates. You can read more about different name plates on my blog.